When we eat out, it is normally the North Indian food that gets ordered. Naturally the vegetarian gravy is always Paneer Butter Masala no doubt. When there are more vegetarians dining along with me, the other dish that gets the next place will always be the Dal Fry. Dhal Fry complements the spicy paneer Butter Masala and makes a great combo with the vegetarian fried rice too. It’s always very mild but is rightly done in all quarters. I always wondered why it is called fry, because it is a liquid dish. We tag a fry to be a dry dish. I guess this gets it’s name from the fact that the restaurant chefs have all the things pre-cooked for this dal and just fries it before serving. Of course same goes for all other things, except this dish is more of a sauteing than anything else. Anyway when the Paneer Butter Masala is as good as the one we order out in restaurant, I wanted to try out this Dal fry. I believe the unique taste here is because of the Masoor dal. 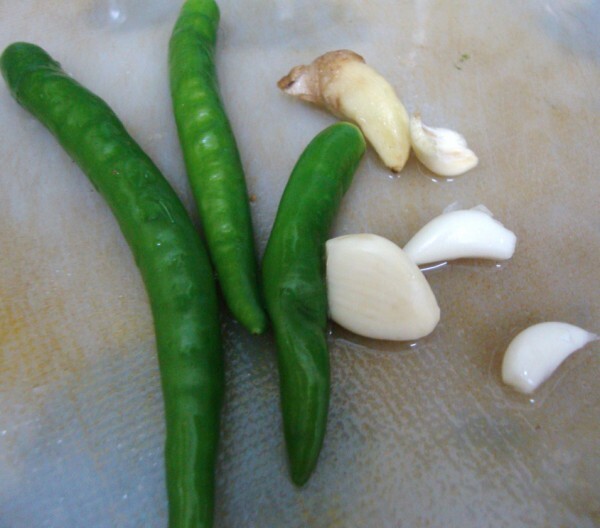 I was browsing through my recipe collection and came across this recipe that I must have got from my GDM group and wanted to try it right away. 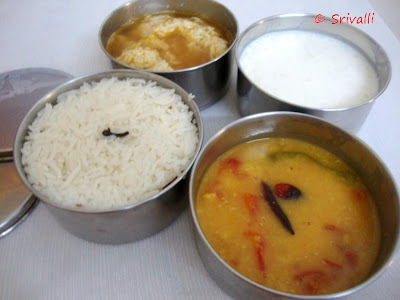 It has the same taste you get in the restaurant and I made it for our Lunch box, paired with Jeera Rice. 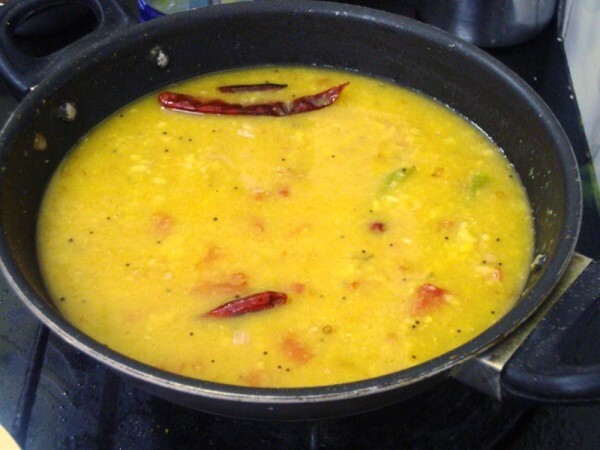 This is a simple dal that can be served with rice/rotis. Especially with fried rice and Naans. 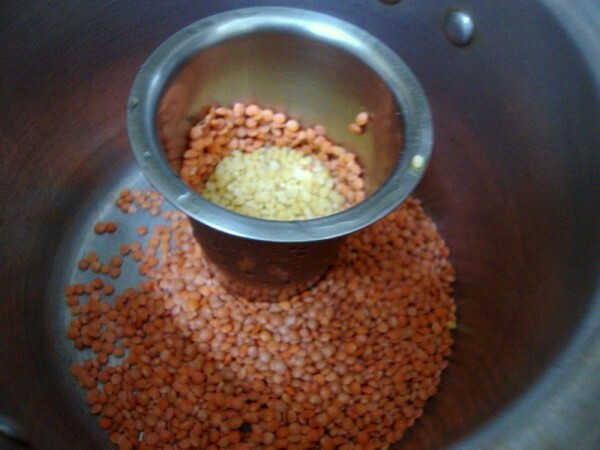 Take both Masoor dal and Moong dal in a pressure cooker. Add green chilies, garlic and ginger to be pressure cooked together. 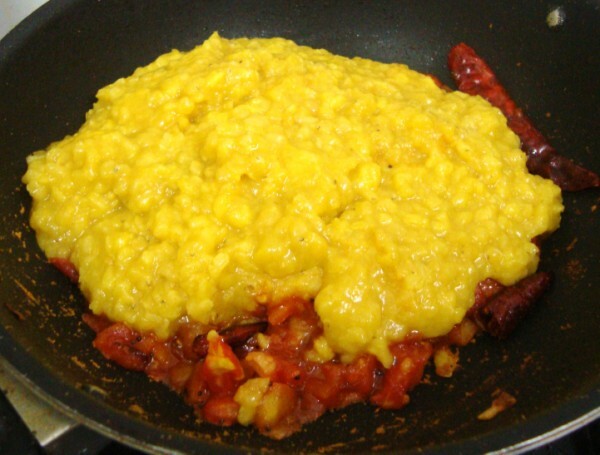 The dal is almost mashed, so you don’t have to mash it any further. 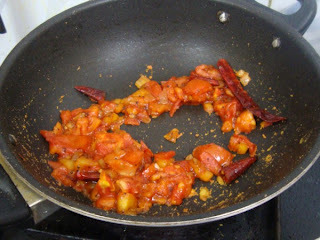 Then add onions, saute till it turns brown. 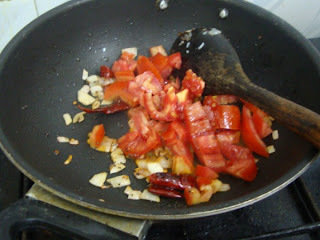 Next goes the tomatoes, add salt for it to turn soft. Mix well and add water as required. Cooking Time from start to finish: 30 mins. 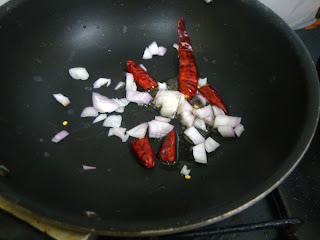 Heat the ghee in a non stick pan, add the cumin seeds and red chilli. Then addd onions and fry till light brown. If you want to avoid ghee you can use regular cooking oil. 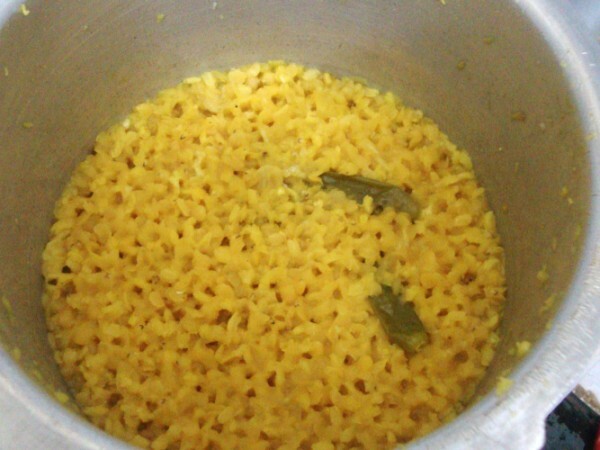 But the restaurant effect comes out more by the addition of ghee. Make this for your Sunday lunch and enjoy! wat a fantastic recipe…awesome presentation ..
We always add a dollop of butter before serving. (forget the calories)…This is a very tasty dish…thank u for posting it. Dal fry looks yummy…. my fav. Such a comforting and yummy dish. I love cooking with masoor and moong dal, I think this combo makes the dal creamy and delicious. Enjoy ur Sunday Valli. 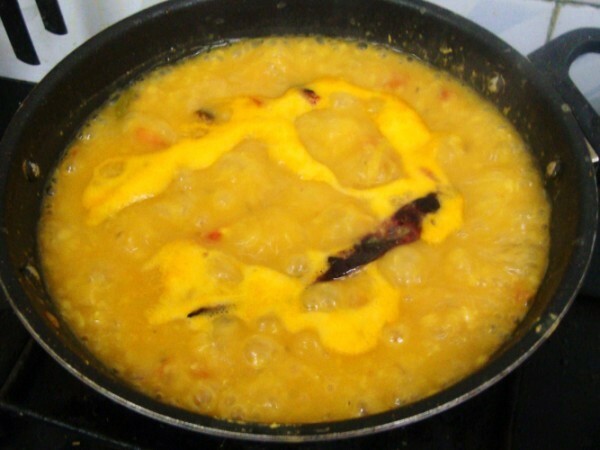 Wat a delicious and inviting dal fry,definitely comforting..
Ooh wow…it looks so yummy! Will definitely try this out 🙂 Thanks for all the pics Sri. 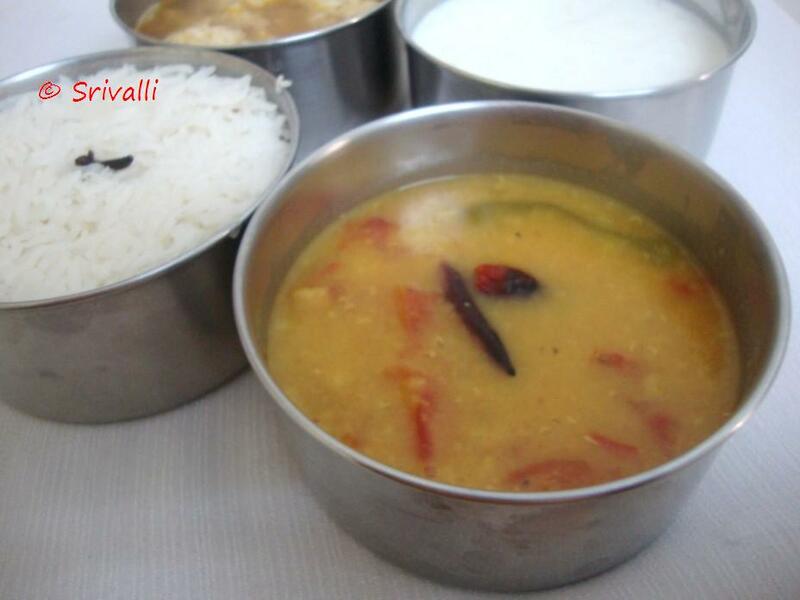 Love dal any time Srivalli,nice recipe for dal fry!